We hope you enjoy browsing our entire selection of Spud & Chloe Patterns! Finished Measurements: Chest: 23 1/2 (25, 28)", Length: 16 1/2 (17 1/2, 18 1/2)", Sleeve length to underarm: 11 1/2 (12, 12 1/2)"
The superwash wool and organic cotton blend make this jacket both soft and easy to care for. Knit in a unique rib, and 30 colors to select from, this piece is just right for both girls and boys on the go. Designed to be oversized, there is plenty of room for growth. Teen sizes XSmall, Small, Medium, Large, XLarge to fit 23 (26, 30, 33, 35)" bust. A figure-flattering cardigan perfect for layering! Instructions include 2 versions - one with solid blocks of color and one with stripes! Length: 24 (24, 25, 25.5, 26.5, 27)"
Sleeve: 20 (20, 20.5, 20.5, 21, 21)"
A colorful cap with a fun crab pattern. A simple twist on a beginner knit. 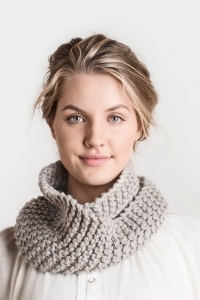 The Crystal Cowl is a perfect project to learn and practice the knitting basics. 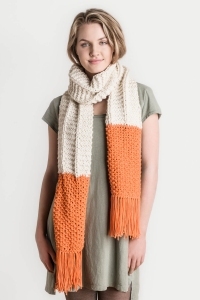 Enjoy the cushy texture and bulkiness of the Outer yarn. Appreciate the fact that it's machine washable. Beginner. Color shown: No. 7220 Rhino . 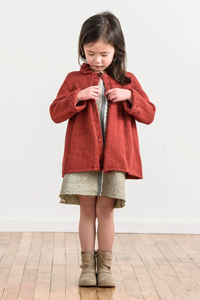 Spud & Chloe Outer (65% Superwash Wool, 35% Certified Organic Cotton; 100g/60yds): 2 hanks. Finished Measurements: Width 11". Length 24" (before twisting and seaming). (A) Spud & Chloe Sweater (Worsted) (55% Superwash Wool, 45% Organic Cotton; 100g/160yds) No. 7528 Life Jacket, 2 hanks. (B) Spud & Chloe Outer (65% Superwash Wool, 35% Certified Organic Cotton; 100g/60yds). A fun jumper-style top with bold bands of color. Chest: 21.25 (22.25, 24, 26.25)"
Length: 12 (12.5, 13, 14.5)"
This swingy cardigan, knit from the bottom up features a pretzel cable at the front edge, and a standup collar. Bust: 31 (35, 39, 43, 47, 51)" ; Length: 30� (31�, 31�, 32�, 32�, 33�)"; Sleeve Length: 17� (18, 18, 18�, 18�, 18�)", with cuff folded up 4"